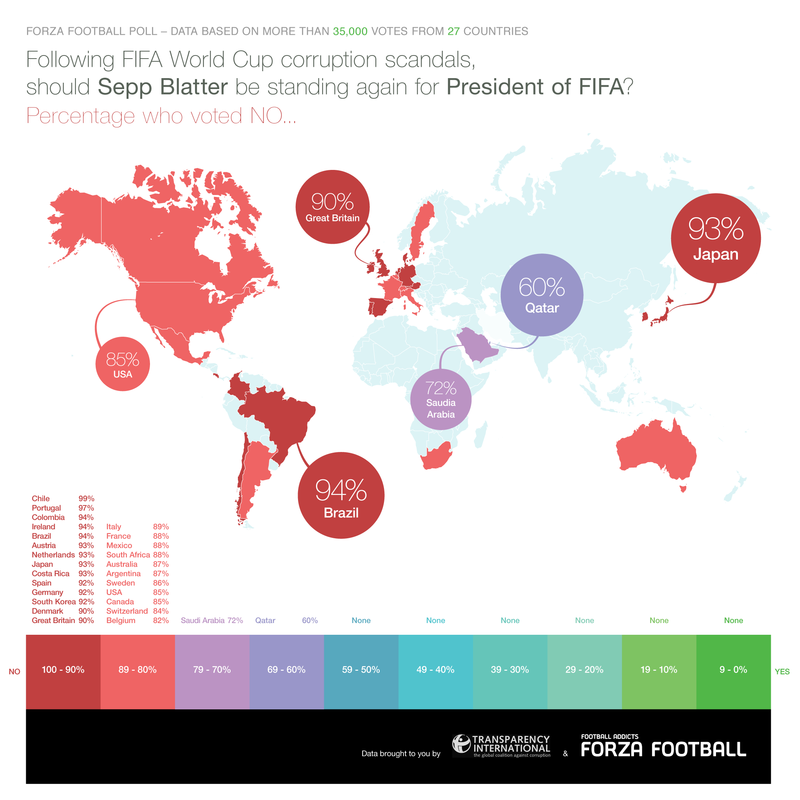 fans do not think Sepp Blatter should not stand for the post and 69.2 % said they had no confidence in FIFA. During last week we launched a poll in the app to try and find out what football fans think about the upcoming FIFA elections. To help us we teamed up with global anti-corrution organisation Transparency International to ask the right questions. Users from 30 nations and more than 35000 of them answered the poll and provided us with valuable knowledge about what football fans think about FIFA and it's President Sepp Blatter. Following FIFA World Cup corruption scandals, should Sepp Blatter be standing again for President of FIFA? Possible answers: Yes, No, Don't know. Who would you pick to run FIFA? Possible answers were the remaining candidates when the poll launched: Sepp Blatter, Luis Figo, Prince Ali Bin al-Hussein, Michael van Praag or None of the above. Which country should host the 2022 World Cup? Possible answers : Australia, Japan, USA, South Korea and Qatar or None of the above. The nations listed were the last remaining ones in the selection process. Do you have confidence in FIFA? Possible answers: Yes, No and Don’t Know. Nation by nation, unsurprisingly Qatar was the country with the most support for Blatter (though only 32%), followed by Saudi Arabia (22%) and his native Switzerland (13%). By contrast, less than 1% of Chileans thought Blatter should be able to stand, followed by Portugal and Ireland with 2% and 3% respectively. Only 6% of British fans thought that Blatter should stand again. Luis Figo was the most popular candidate amongst football fans with 59% of the votes. He was most favoured in his home country of Portugal (84%), Luxembourg (72%) and Mexico (71%), whereas in The Netherlands, Saudi Arabia and Qatar he suffered poor results of 13%, 25% and 34% votes respectively. In an amazing illustration of the lack of faith in FIFA, ‘None of the above’ was the second most popular response to this question. Spain seemed the most disillusioned, with 36% of voters choosing no one, with Canada and France the next behind (both 31%). Michael van Praag’s popularity was consistently around the 8% mark across the board. He was most popular in his native Netherlands with (65%) of the vote, Belgium (18%) Luxembourg (12%) and Spain (9%). This was not matched in countries such as Brazil (2%), Qatar (3%) and Portugal (3%). only received 2% of the votes. Sepp Blatter, despite being the bookies’ favourite to win the election, took only 2% of the total votes. He was most popular in Saudi Arabia and Switzerland (with a measly 9%) followed by Qatar (8%). In Australia, New Zealand, Portugal, Thailand, Luxembourg, Netherlands and Chile he took less than 1% of the total votes. Australia was the most popular choice at home (89%), in Colombia (51%) and in South Africa (46%), whereas in Japan, Saudi Arabia and Qatar it suffered poor results of 4%, 5% and 6% votes respectively. Japan popularity soared at home (79%), in Thailand (39%) and in Portugal (17%). This was not matched in countries such as Australia, Qatar and Argentina however, in which it only received 3%, 5% and 5% of the votes respectively. USA took only 58% of US votes, followed by 50% of the votes from Costa Rica and 40% from France. In Australia, Qatar and Japan it suffered poor results of 3%, 3% and 4% votes respectively. South Korea was an unpopular choice across the board. It took 75% of its own vote, but the next two best results were South Africa (16%) and Belgium (7%). On the flip side, it received less than 1% of the votes from Luxembourg, Qatar and Saudi Arabia. Qatar earned a polarised set of results. It took 86% at home and 80% in Saudi but then the next highest result was Argentina with only 18%. They took only 1% of the votes in Belgium and Australia, and 3% in South Africa. It's pretty clear that the powerful people of FIFA are disconnected from the public opinion and that the football world has not come a long way when it comes to democracy. Football deserves a FIFA President that will develop the democracy of the organisation that runs the game we all love. Master of blog and universe.